Agave plant, Agave americana, is also known as Century Plant and Spiked Aloe. Ideal for landscaping and planting in poor soils. The sap is used as a soap substitute and natural insecticide for plants. Medicinal use as diuretic, for constipation and burns. Used as a laxative, diuretic and antiseptic. Water in which the agave fibre has been soaked for 24 hours is used as a scalp conditioner. 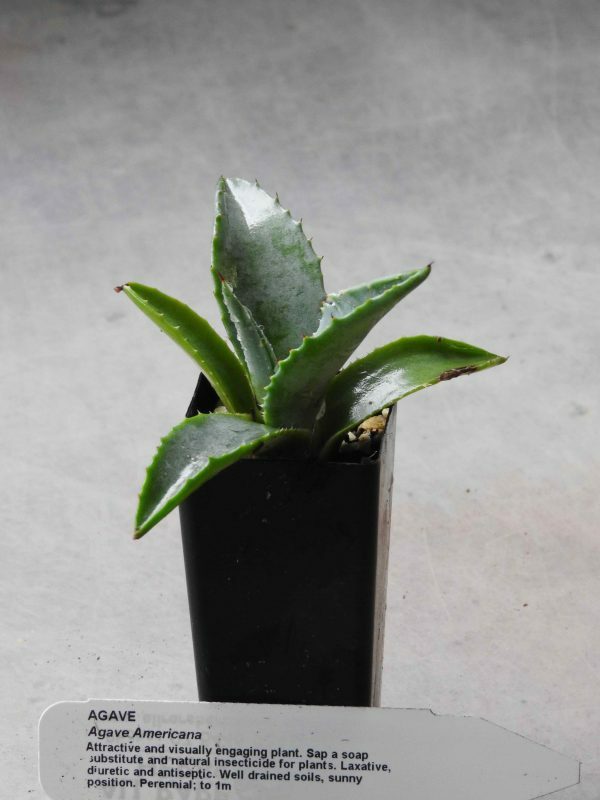 Agave plant is native to tropical America and prefers well drained soils in an open sunny position. Flowers are only produced after 10 years. Drought and frost tolerant. A perennial plant to 1m. Be the first to review “Agave, plant” Click here to cancel reply.